Each year as Christmas approaches, the spirit of thrift and enterprise descends upon me and I decide that there is nothing people like more at Christmas than a home-made gift. What do you mean you wanted perfume? I’ve made life-sized gingerbread versions of you and your family – be grateful! Therefore, every year I try to create something thoughtful and wonderful. You will not be surprised to hear that it often ends in failure. So, as we stagger towards Christmas with daily hangovers, mild exhaustion and that nagging sense that we’ve forgotten to buy bread sauce, I thought I would lighten the load by sharing with you some of my least successful, festive culinary moments. Never try this unless you are a degree-educated physicist who actually understands the correct way to boil sugar. I neither understood nor owned the correct equipment. All I will say is that using a meat thermometer (fear not for it was clean) and estimating that the correct temperature is somewhere between ‘chicken’ and ‘turkey’ is not the way to go about this. I did manage to produce something pink and gloopy but unfortunately it bore a worrying resemblance to human intestines. Not that festive, even when wrapped in shiny cellophane and tied with a sparkly bow. I’ve always wanted to be able make bread and one day I will learn provided I can develop a less impatient and more conscientious approach to cooking. I did buy a proper panettone tin and I did make a proper dough but I either under-proved, over-proved or looked at it funny because I managed to produce the flattest panettone ever. Unfortunately no-one from the Guinness Book of World Records was there to witness it. It did taste nice heated up and served with ice-cream but then everything does, doesn’t it? Who knew that chocolate could separate just by heating it up? Not me. Still, the addition of cream and butter seemed to help and it turned into some reasonably acceptable fudge. This actually wasn’t a culinary disaster but I made it for my daughter and ended up eating it myself which turned out to be a disaster when I stepped onto the scales on New Year’s Day. I decided that my children deserved an end-of-term treat and made them a proper gingerbread house with boiled-sweet glass windows, gingerbread versions of their lovely selves and Santa and Rudolf sitting inside by the fire (yes, my friends, I MADE a fireplace). I had to cut out templates, measure the gingerbread with a ruler and use enough royal icing to cement an actual house. I was up until midnight the day before decorating it and ate so many sweets as a ‘reward’ whilst I worked that I couldn’t get to sleep for about three hours afterwards. 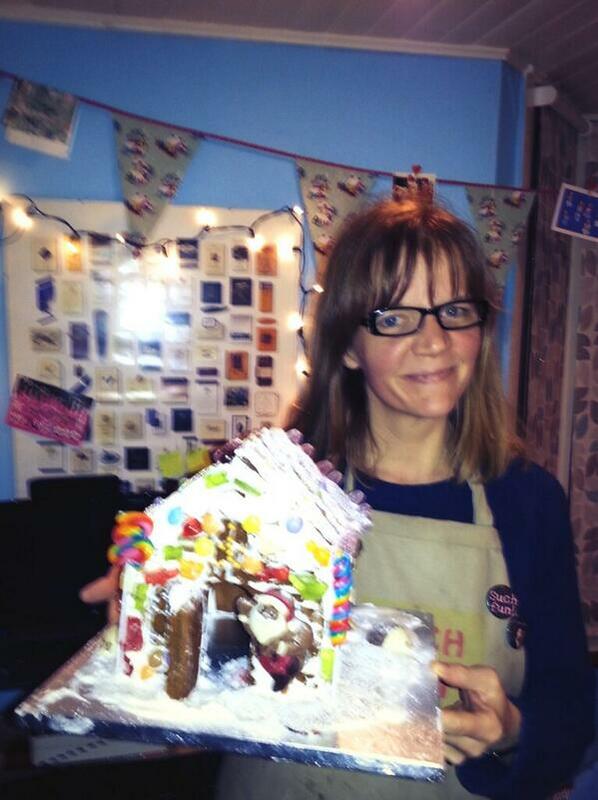 The result was lop-sided and probably would have failed all building inspections but my children loved it. The following year I went to a cake shop and bought a gingerbread house mould. It’s not all disasters though and I have one particular recipe that I re-visit every year and which has become reasonably famous in at least three houses in the south-east London area. So as a little Christmas gift for you, reader friends, here is a link to the spicy Christmas Chutney recipe by the wonderful Mary Berry. It never lasts beyond Boxing Day in our house and goes with meats, cheeses and probably leftover Christmas pudding too. Every year, my husband looks forward to peppernotten, which is pretty much the easiest thing on the planet to make (thankfully). The only problem is that it’s MESSY. I think you’re really brave to try your hand at making a gingerbread house. I’ve always felt a little too intimidated by the idea to try it. Ooh I’m going to look up ‘peppernotten’ – I LOVE easy! Actually, having done the gingerbread house a few times now, I’ve refined the technique by using a mould, plus it’s a great excuse to use up all those sweets (and scoff a few ‘broken’ ones along the way). Brilliant! Thank you for sharing these. They gave me a real chuckle. I’ve learned that Christmas is just too hectic to try to make presents, but I’m still foolish enough to think I can make birthday cakes for other, less over-comitted times of year. My best flop was trying to make a “skirt” for my daughter’s 10th birthday princess cake. I bought the torso and head topper and then dutifully baked three layers that I was going to “sculpt” into a skirt. Except that with cleaning for the party and wrapping presents and everything, I left it rather late to start cooking and was up at midnight still waiting for my rounds to brown. Midnight is much too late for me (especially after a few glasses of wine) and I ended up dropping one of the layers as I brought it out to test it. Predictably, it exploded all over the kitchen floor. I finished the cake at 5 am, yawned my way through my daughter’s party and ended up leaving my poor husband to cope with the girls who were sleeping over while I crawled into bed at 8 pm! Not my finest hour (although the cake was quite nice, if I say so myself!). Glad you liked them Emma and what a valiant effort on the princess cake – I salute you! Pity you didn’t have pictures of those disasters!!! It’s either a pity or a blessing! Love the chocolate story – I truly admire that level of chaos.